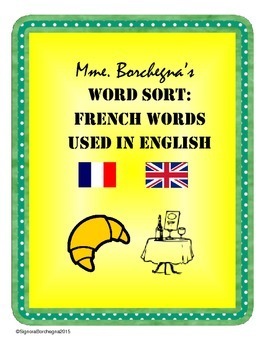 Word sort activity using French loan words "borrowed" from French. 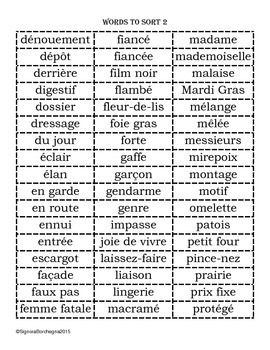 This activity provides French students with an opportunity to build on their background knowledge about the French language during the first week of school or with a substitute teacher. 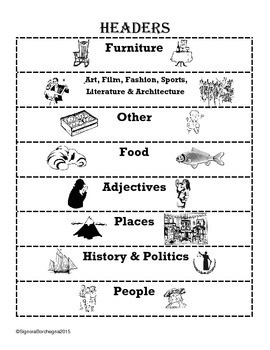 This activity could also be used at any time during the year or in an English/Language Arts classroom to develop English vocabulary (because all the words are also used in English) or a Social Studies/History unit. Separate pages to sort could also be split into separate lessons. 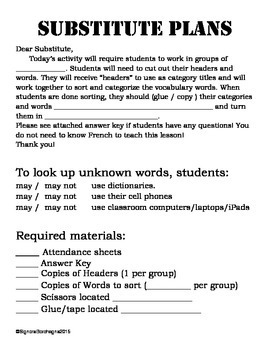 Pages include one page of headers, three pages of words to sort (123 words total), an answer key, a skeleton lesson plan outline for a substitute, and a how-to page. Cover page and credits/thank-you not included in page count.